Air Asia Promo Fare 2017: Join us this week as we celebrate the inaugural flights of our newest destinations, Taipei and Singapore! All our other flights are on a promo, too! Low fares to keep on traveling with your family & friends! 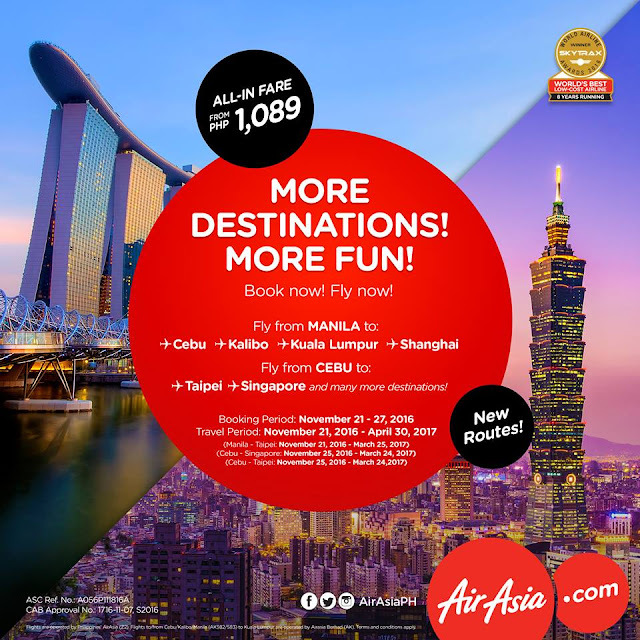 Fly from Cebu to Manila, Singapore, Taipei & many more from as low as Php 1,204 ALL-IN ONE WAY FARE! Head over NOW to http://bit.ly/MoreDestinationsMoreFun to book! It is the capital city where it is home to Taipei 101 (the tallest building in the world by 57.3 m or 188 ft). It displaced the Petronas Towers of Kuala Lumpur, Malaysia. The record it claimed for greatest height from ground to pinnacle was surpassed by the Burj Khalifa in Dubai, which is 829.8 m (2,722 ft) in height. Definitely, Taipei is a must-visit city where you can see a lot of picturesque scenery for your one-of-a-kind trip. And of course, check on this domestic flights on promo. All fares are quoted for single journeys (one-way) and for dedicated travel periods only. Fares include airport taxes.